Hyundai launched the Xcent earlier this month. The Xcent is Hyundai's first sub-4m sedan in the Indian market and replaces the popular Accent. It goes head-on with the Maruti, Honda and the car which created this segment- the Tata Indigo eCS. We took a quick spin in the car and here is how it feels. The Xcent has a face like the Grand i10, the hatchback on which it is based. Head-on, the feature which distinguishes it from its hatchback sibling is the chrome outline on the grille. The alloy wheel design is also different when compared to the hatchback. Speaking of the wheels, Hyundai offers 14-inch wheels as standard on the lower trims while the higher variants come with 15s. The flowing lines at the side neatly converge into a stubby boot - the likes of which are shared by the others in its segment. The Xcent boasts reasonably tight shut lines and overall quality is on par with what we have come to expect from Hyundai. While the front seat dimensions haven't changed, the rear has more leg room than even the hatchback. Step inside the cabin and it feels familiar - reminiscent of the hatchback. The only exception being that Hyundai has replaced the manual AC with a climate control system in the top-end Xcent variants. The car we drove had keyless entry and a push-to-start button. The glovebox is also cooled. Keeping in sync with times, the steering wheel has audio controls and the Xcent's music system has a 1GB storage space and Bluetooth connectivity. Moving on to the rear, the Xcent has a segment-first rear AC vents and also an arm-rest with cup holders. The leg space is similar to what you get in the Grand i10, which itself is one of the roomiest hatchbacks in its class. This aside, the Xcent's illuminated boot is the largest in its category at 407 litres. It is quite a usable one as well. Like with every other car in this segment, Hyundai has a diesel and petrol engine for the Xcent. 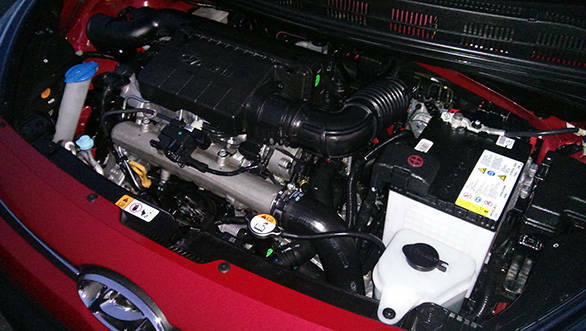 Both the diesel and petrol motors do duty under the Grand i10, however the diesel gets a 1PS and 20Nm bump. 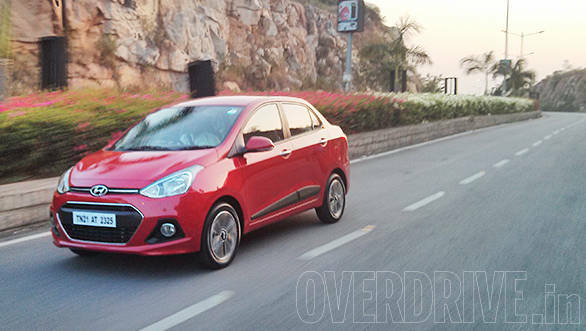 We drove the diesel Xcent as it is expected to account for a chunk of the sales. At low rpms, the engine is a tad on the noisier side, however as the revs build up (post 2,500rpm), it smoothens out. Also, the engine has a slight pinging when the revs are low, but this could very well be down to poor fuel quality, and we will only be able to give a clearer cause of the noise once we test the car. The extra 1PS and torque don't actually manifest themselves though. 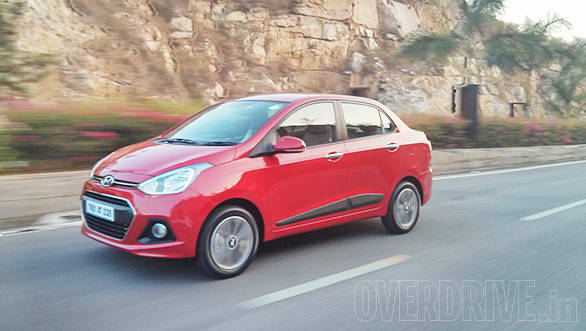 Hyundai claims a fuel efficiency of 24.4kmpl with the diesel Xcent. The 83PS petrol Xcent also gets the option of a 4-speed automatic apart from the standard 5-speed manual transmission. The Hyundai Xcent diesel has comfortable seats in the front and rear. While the front seat dimensions haven't changed, the rear has more leg room than even the hatchback. Taller passengers in the rear also have plenty of space under the front seats. 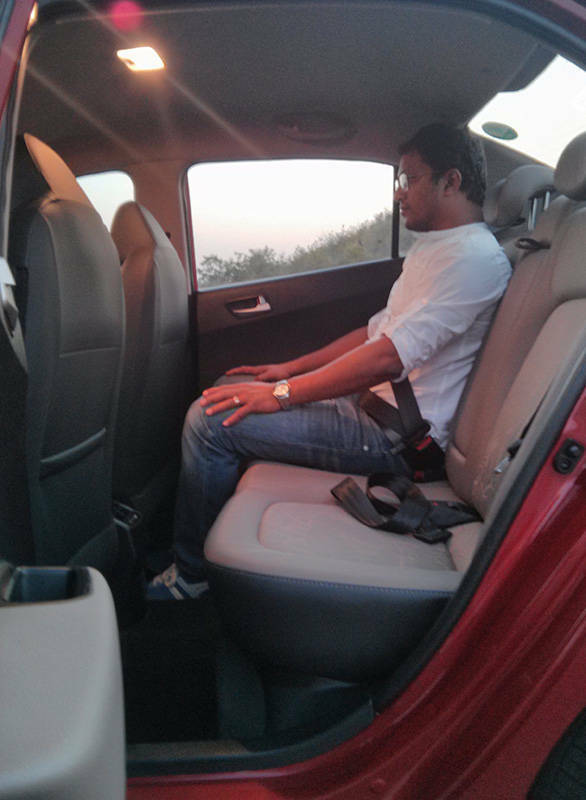 The under thigh support is also good but then you sit upright in the Xcent as compared to the Grand i10. The Xcent is also set up on the softer side like the Grand i10 and the result is a pliant low-speed ride quality. 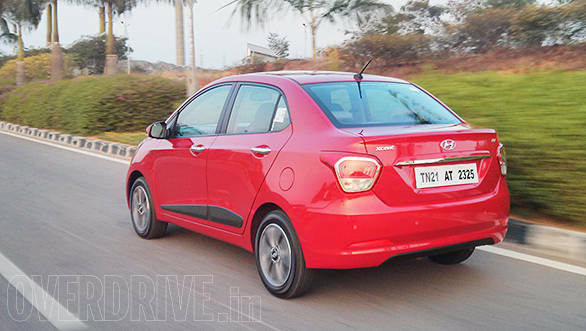 The steering feel is similar to the hatchback and this means a light and easy to manoeuvre sedan in the city. Hyundai has provided ABS as an option on the SX (O) diesel Xcent, while dual airbags are standard. The Hyundai Xcent is a complete package and there is little to fault it with. Given the killer pricing that Hyundai has launched it in India with, a figure which undercuts its aforementioned competition by a good thousands and with kit levels similar to what others have to offer, we believe the Korean automaker has another sales success story on its hands.